Do you ever wish you could have a do-over? Sometimes, you need to take a day or a weekend to reset your home back to clean and clear the clutter, but it could be an overwhelming project if you’ve neglected the chores for several weeks or months. Cleaning and organizing is a big time commitment, but you’ll love the results after you’ve finished the project. Here’s an efficient way to conduct a whole home reset to help get your place back in tip-top shape. Over time, it’s easy to throw a book here and a piece of mail there and a few days later the stacks seem to multiply and expand. The best part of cleaning off the surfaces in your home is you get to see quick progress. So, grab a trash bag, and do a quick sweep of the house removing all the trash that might be lingering on surfaces. After the surfaces are cleared off, the next step is cleaning up the floors. Just like the surfaces, pick up the clutter and throw away the trash. If it is clothes, then throw them in the hamper. Sweep, mop, vacuum and consider scheduling a carpet cleaner to come in and remove the dirt and dust that might be settled below the surface. After some quick wins, you’ll probably have the motivation to tackle one of the toughest rooms in the house. Of course, cleaning the dishes is a must, but to reset your home back to clean, there are a few tougher spaces that need your attention. • Throw out bad food from the refrigerator, and clean the shelving. • Detail clean the oven and stove. • Wipe out the microwave. • Organize the cabinets and pantry. Also, you know that one drawer in the kitchen with the paper clips, random keys, and pens with no ink? Yes, you do. Clean that one too. Give yourself several hours for this room since there is typically a lot to tackle. It’s a very busy room, so clutter likes to hide in a lot of different places. The next toughest room in the house is your bathrooms. To get your home back in shape, you’ll have to finally organize those bathroom cabinets. Throw away all of the old and unused products and properly dispose of your expired medicines. Grab some window cleaner and clean off the mirrors as well as the shower door if its glass. Speaking of showers now is the time to grab an old toothbrush and use baking soda to clean the grout and other tough corners in the tub or shower. Don’t forget to wash around the base of the toilet. Yes, it’s gross, but if not now, then when? The next step for resetting your home back to clean is tough, but also freeing. Sometimes it is hard to donate or throw away items out of your home, especially clothes, shoes and little trinkets. A good rule of thumb is if it doesn’t have deep personal meaning and it isn’t useful, then throw it away or donate it. The reality is, if you find out later that you actually needed a particular clothing item or something else you’ve previously donated or thrown away, then you can just replace it. However, if it hasn’t been useful for a year or longer, you probably won’t miss it much. Minus closets, bedrooms are pretty easy to clean. Just like the rest of the home, start with the surfaces, move on to the floors, and then take a moment to make the bed. Before you vacuum or sweep the floors, look up at the ceiling to remove any cobwebs or dust your ceiling fan. To finish all this work in a day or a weekend, you’ll need to use your time strategically. Don’t get lost in a new Netflix series or distracted by social media, just commit and make it happen. The rooms that will require the most time and effort are the kitchen and the bathrooms. Bedroom closets might also be time-consuming if you have years of clothes that need to be sorted. If you have kids and a spouse, make it a family affair. Divide and conquer. 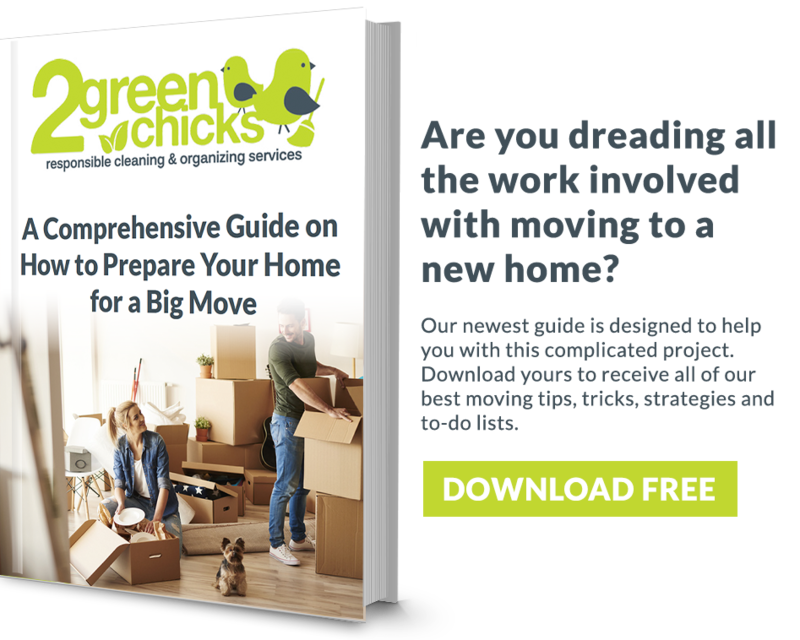 Hire 2 Green Chicks for Help! For regular upkeep, we have a professional team who can visit your home weekly, biweekly, monthly or just whenever you need us. We understand you’re busy, and not everyone wants regular cleaning services, which is why we also offer a deep clean service. We’ll assess the space and the tasks needed to get done, and then provide you with a quote. The best part is you get to reset your home without having to invest time and sweat into the project. The best time for investing in our deep clean option is before you make a big move. 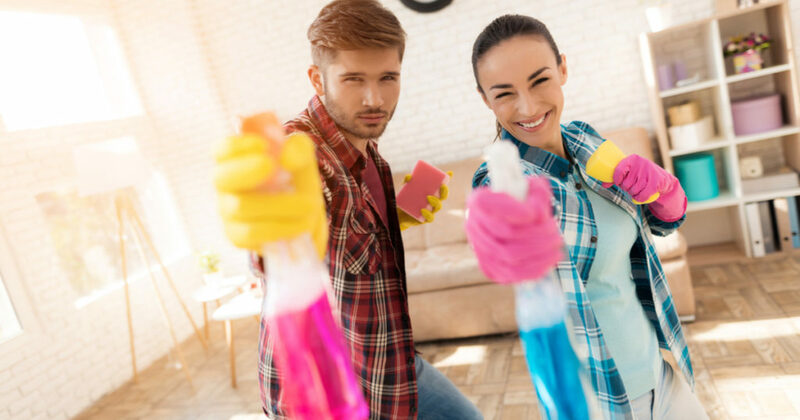 Not only do you want your future home to be clean when you move in, but you also want your home to look stunning for prospective buyers. In addition to our services, we’ve also crafted a moving guide to make your transition easier. Download your FREE copy today.